to enjoy fall foliage . . . I will return next week, October 17. Thank you, Jill, I plan to! Enjoy your break! I hope you see some beautiful colors (not too much here yet). Yes, it just turned cold in the higher altitudes, so I’m expecting bright color, Merril! Hope you have a wonderful time, Marian! With several rounds of edits behind me, I’m making time for a break! You deserve it Ms Marian! A colorful lady to blend in with the beautiful foliage. Marian — You Leaf Peeper, you! That’s a new one ~ thanks, Laurie! Thanks for the good wishes ~ and the cute emojis, Fatima! I didn’t know orange trees turned color in the fall! Enjoy. 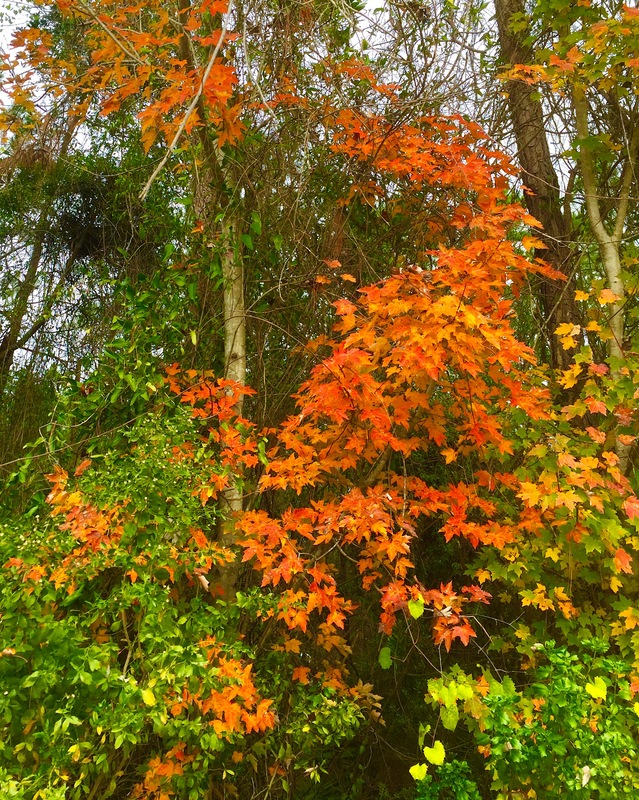 Believe or not, this photo was taken in Jacksonville, not in fall, but early January. We are in Ontario for an autumn holiday to visit our daughter and family who have just moved to a new place. The foliage here is breathtakingly gorgeous, and will be even more so on our drive home. And here we have sunshine and balmy weather, whereas in Winninipeg it has already snowed twice! It sounds as though you are on Cloud 9. I’m so happy you can be with family . . . and a “breathtakngly gorgeous” view too! Florida doesn’t have distinct seasons either, much like Thailand, I suspect. I guess you make up for it in other ways, like abundant fruits 🍌 and veggies 🌶 year round, or so I think! We’ll enjoy the brilliance wherever we are. Thanks, Liesbet!